Relics are holy objects associated with holy people such as Jesus or the saints. The use of relics was by no means a new phenomenon, it existed previously in Judaism, Buddhism and several other religions. In a world where people believed that evil and the Devil existed all around in the natural world, it was comforting to believe that good was also something that could be seen and touched. The motivation for most pilgrimages was to see and touch something holy and consequently benefit from being in contact with good. These early relics were often carried in small, purpose built containers called reliquaries which were hung around the neck, almost like good luck charms. Of course, medieval people did not believe in luck, they believed that God controlled everything (see Church). Therefore, by wearing the relic you were showing you believed in the Christian faith and consequently you hoped God would reward you by making good things happen. The second kind of relic which became common after the 7th century were bodily relics, these were actual pieces of the body of the saint: a bone, a piece of hair, the head etc. The Church initially outlawed the movement of the body of a saint from the original burial place but over time both the movement (translation) and dividing up (partition) of the body of a saint was allowed. 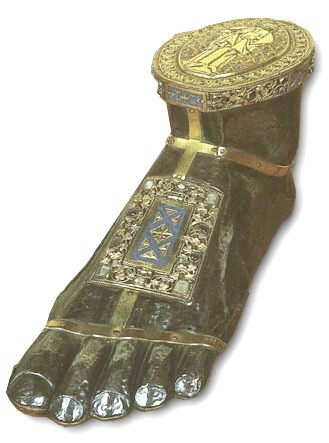 Two factors explain the spread of relics all over Europe from the 8th century. Firstly, after 787 all new Christian churches had to have a relic before they could be properly established or 'consecrated'. During this time, much of northern Europe was being converted to Christianity and there were many new churches that required relics. As a consequence, the Church partitioned and translated a portion of her collection all over Europe. 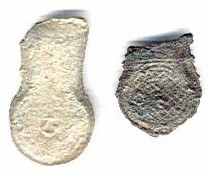 The second factor which explains the spread of relics was the value placed on them by influential collectors all over Europe. Owning a large number of relics became a symbol of status and power for both private collectors and kingdoms. 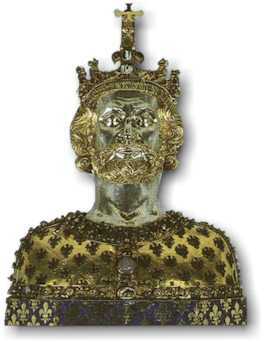 Emperor Charlemagne (742-814) set a trend with his massive collection at Aachen that later monarchs of Europe tried to follow. Bodily relics were particularly important because the spirit of the saint was said to actually remain in the bodily remains. Wherever the body (or body parts) went the (holy) spirit was sure to follow. There were some religious critics who suggested that the cult of relics owed more to pagan traditions than Christian teaching, but such was the popularity of the relics and the miracles that surrounded them, it would have been very difficult for the Church to resist even if it had wanted to. In converting pagan people the Church needed every trick in the book. In the 13th century, even the great medieval philosopher and saint, Thomas Aquinas, produced a threefold defence of the cult of relics. He argued that, firstly, the relic acts as a physical reminder of the saint, making it easier for people to understand the importance of the saint. Secondly, because the saint worked miracles through the body, the body remains holy and is therefore valuable in itself. Finally, because miracles occur at sites with relics, God must approve of the preservation and worship of relics. When the church began to allow the partition and translation of relics, the business of trading in relics began to take off. Even before this time there were many professionals who made a living out of buying and selling relics. Since it was extremely hard to verify the authenticity of the relics (there were no DNA-tests or carbon-14 tests in the Middle Ages!) the trade was a goldmine for all fakers and forgers. This was particularly the case after 1204, when the fourth Crusade captured Constantinople, which had perhaps the largest collection of relics in Christendom. The Constantinople relics found their way into churches all over Europe. The only way of guaranteeing yourself a widely acknowledged, 'authentic' relic was to steal one. Many of the most famous pilgrimage sites in Europe included stolen relics in their collection. The theft was easily justified. Often the idea for the theft came in the form of a dream or vision, which was widely considered to be the way God and saints communicated . Often the saint itself decided. If the saint allowed itself to be taken without punishing the thieves and if the saint continued to produce miracles, then clearly he or she was happy in their new home. But there was only really a problem for the Church when two shrines claimed to have the same relic (in the 11th century, there were at least three heads of John the Baptist in circulation and this was true of a number of equally 'unique' relics) or when a church claimed to have a relic of obviously questionable validity. This was particularly the case with bodily relics of Christ. His adult body was, of course, resurrected to heaven, leaving no bones for collectors to hoard. But there were parts of his body separated from his body, that did remain on earth. There were multiple copies of everything imaginable, from umbilical cords, to milk teeth, all over Europe. 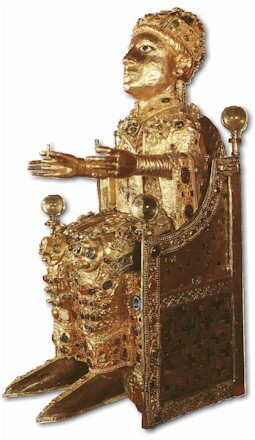 In the 11th century, the popes' private chapels in Rome contained the umbilical cord and foreskin of Christ in a gold and jewelled crucifix and preserved in oil, along with the following impressive list of relics: a piece of the true cross, the heads of the saints Peter and Paul, the ark of the covenant, the tablets of Moses, the rod of Aaron, a golden urn of manna, the tunic of the Virgin, various pieces of clothing worn by John the Baptist including his hair shirt, the five loaves and two fishes which fed the five thousand and the table used at the Last Supper. (Sumption: 222-3) Relics were big business! It illustrates the extent to which churches were prepared to compete with rival pilgrimage sites. Pilgrims expected to be impressed by the quality of the reliquary. If a reliquary was beautifully made by the finest craftsmen, out of the most precious materials, it not only represented the power of the saint, it also meant that lots of previous pilgrims had been impressed with the saint's power. The tomb of St. Thomas of Canterbury was completed at enormous expense in 1220. When Henry VIII closed the monasteries during the English Reformation, the jewels and precious metals from the tomb of St. Thomas alone filled 26 carts! Apart from the relics and magnificent reliquaries, the pilgrimage churches found other ways to commemorate the miracles of their saints. Artists might be commissioned to paint murals on the walls of the church that described the story of the saints. Churches also had sculptures and tapestries that told the stories of the miracles. In a society where few could read or write, pictorial communication was vital. (Above) A detail from Bourges cathedral France showing the Last Judgement. Many of artistic riches of the churches came from grateful pilgrims as offerings of their thanks. Perhaps the strangest way of thanking the saint, involved the pilgrim making a wax model to represent the part of the body that had been miraculously healed. Churches encouraged this tradition because, as with the magnificent reliquaries, the exhibited wax body parts were proof of previous miracles. Sometimes these offerings of proof could be a little bit gory: Henry of Maldon's tapeworm was hung on the altar of Canterbury cathedral, alongside a real finger of the shepherd who hoped that St. Thomas would help him grow another! In general, shrines expected to receive more useful offerings from their pilgrims. Pilgrims were expected to offer as much money or jewels as they could afford. The miracle stories were full of accounts which told of the dreadful consequences of failing to be appropriately generous. One lady pilgrim who left the basilica of Conques with a valuable ring on her finger, became suddenly ill and was only cured when the monks thoughtfully removed the ring and placed it in their treasury. 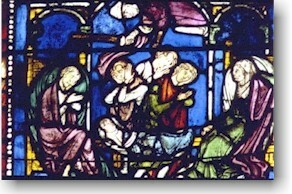 Perhaps the most famous of this type of story concerned Sir Jordan Fitz- Eisulf; a story told through the stained class at Canterbury (see right). Having been saved from the plague by drinking the holy water of St Thomas, Fitz-Eisulf collected four silver coins as an offering to the saint. When he failed to give the coins to the shrine as promised, the plague returned and killed his oldest son. In the stained glass, Fitz-Eisulf can be seen pouring a big sack, full of coins over the shrine. (Above) St Thomas appears from above spreading the plague amongst the family of Fitz-Eisulf.